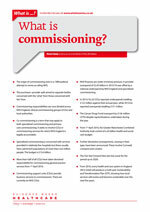 What is commissioning? | Whatis Series...? The origin of commissioning rests in a 1989 political attempt to revive an ailing NHS. The purchaser–provider split aimed to separate bodies concerned with the ’what‘ from those concerned with the ’how’. Commissioning responsibilities are now divided across NHS England, clinical commissioning groups (CCGs) and local authorities. Co-commissioning is a term that may apply to both specialised commissioning and primary care commissioning. It seeks to involve CCGs in commissioning services for which NHS England is legally accountable. Specialised commissioning is concerned with services provided in relatively few hospitals but these usually have catchment populations of more than one million people. The budget is £15.6 billion. More than half of all CCGs have taken devolved responsibility for commissioning general practice services from 1st April 2016. Commissioning support units (CSUs) provide business services to commissioners. There are currently six NHS CSUs. NHS finances are under immense pressure. A provider overspend of £2.45 billion in 2015/16 was offset by a national underspend by NHS England and specialised commissioning. In 2015/16, 62 CCGs reported underspends totalling £122 million against their annual plan, while 39 CCGs reported overspends totalling £151 million. The Cancer Drugs Fund overspent by £126 million (37%) despite reprioritisations undertaken during the year. From 1st April 2016, the Greater Manchester Combined Authority took control of a £6 billion health and social care budget. The Five Year Forward View sets the scene for the period up to 2020. From 2016, every health and care system in England (44 in total) will produce a multi-year Sustainability and Transformation Plan (STP), showing how local services will evolve and become sustainable over the next five years.